In the “keep it real’ category, Paul just got a 10! We recommend that everyone in the Tulsa or KC entrepreneurship scene re-reads that so it can sink in. The duck analogy is the best part; it helps shed light on one of the things that we see our best founders struggle with. When they start to gain traction, and success starts to drizzle upon them, things seem to stay as difficult as they always were. We meet with them one-on-one when this starts to happen because they feel like they’re missing something. It just doesn’t seem to make sense to them. They just raised a round of angel investment. Or customers are landing twice as fast as they used to. Or a great new hire came aboard. Shouldn’t things get easier? Things are never going to “get easier”. The startup is simply going to get better-and-better at implementing the model, and the business will start to bite off more-and-more at a time. It ends up being a wash. That’s the irony of startup growth: the very success you’re experiencing is also making your experience more difficult. It’s sometimes hard for our successful entrepreneurs to swallow this large pill. We largely blame this on society and how it portrays successful startups. Techcrunch glorifies their raised venture capital rounds; Demo Days put the best and the brightest on stages in front of thousands of people; other Entrepreneurship leaders are seen ‘shaking hands and kissing babies’ at events all over town. Why is it so easy for them? Don’t get us wrong – getting in Techcrunch, pitching at Demo Days, and exuding confidence at networking functions are all important – but their jobs as leaders is to make it APPEAR as if it’s easy. Remember the duck? Under the water they’re paddling their little hearts out trying to stay afloat, but they look as calm as they could be above water. Great entrepreneurs understand the importance of making it look easy. The easier they make it look, the more people assume they have it under control. But the fact is, they only sort of have it under control. The realities are that even the best entrepreneurs are just falling gracefully. It’s a controlled chaos. Actually having something under control would actually be more of a red flag than a controlled chaos. It’d be a symptom that the entrepreneur isn’t pushing the bounds enough, or that they’re not innovating and instead just following tried paths that won’t result in groundbreaking returns. The point of this essay is not to help you paddle under the water in a more graceful fashion. We don’t have the answer to that. 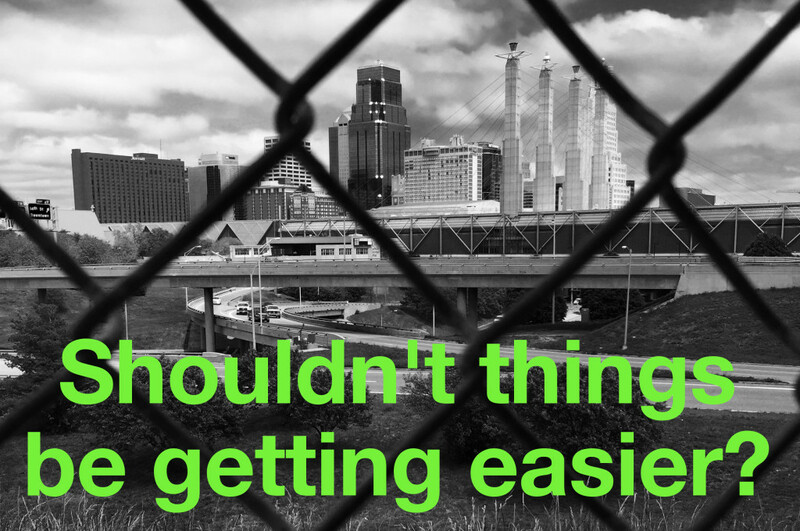 Anyone who says they do is probably trying to sell you an e-book on KC entrepreneurship. Instead, the point is to help you feel more okay with being the duck that’s barely surviving on the open water. We promise that all the other ducks simply appear to be just lovin’ life; when in fact they are on just as difficult of a path as you are.